For those hot summer days we have a swimming pool with wide stairs that function as a kiddie pool for our littlest neighbors, a 2nd set of stairs that also serves as a bench for seating in the water, shallow end, and deep end with ladders. 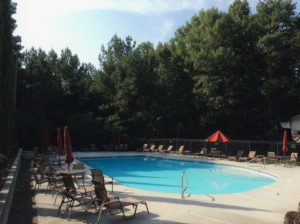 Our pool area offers tables and chairs with umbrellas, lounge chairs, restrooms inside the clubhouse, and a shady back porch with ceiling fans to hide from the sun. The pool is secured via electronic gate lock. 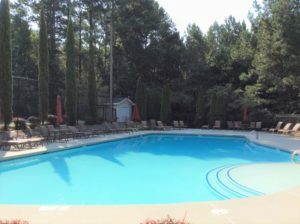 You will need your pool access card to enter the pool area. It’s a great place to meet your neighbors. For a new, or replacement, pool access card, please complete the Pool Access form, attach payment and place in the community mailbox at the clubhouse. If you would like the card mailed to you, please include a Self-Addressed Stamped Envelope and the card will be mailed when ready. You will be contacted when the card is ready, per the info provided. In the event you do not receive your pool access card in 5 business days, please contact the Board at 678-723-5705 or at board@westministervillage.com. *Note: There is a $25 fee for a replacement card.